When I read your first post I thought something was a miss. Personal Imports only need to meet the minimum ADR's. I have imported two personal imports, and never had an issue with HIDs, or mods to the cars. However, I suspect, SA to be a bit stricter. Congratulations. Why can't we get ?s into Australia? Any chance we can get the new cube model? Hello, I accidently uploaded pictures of my son instead of pictures of my car in my classifieds advertisement. Is it possible to delete the baby photos? Or if not, can I delete the advertisement? Thanks Will EDIT - admin seemed to have deleted the images - thank you! Make : SUBARU LIBERTY Transmission : Manual Kilometres : 80000 Price : $14,000 Condition : Used Hello all, I am moving to a very remote area in Western Australia in February to teach in a remote school. I have decided that I cant take my Legacy as high octane fuel is not readily available where I am going. I also dont want to see my Legacy wrecked in anyway on the dirt roads up there. I am planning on buying a small soft offroader which will give me a bit more clearance on dirt tracks. I was planning on putting the car into storage but have since changed my mind and would prefer the car go to someone who will enjoy it. 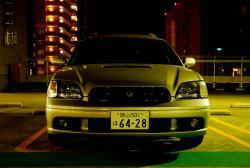 I purchased the car in Okayama Japan from a sports car dealer. I was visiting the car yard to look at an RX7 that looked nice, and ended up leaving with a purchased Legacy. To me this car is a practical sports car. I believe from the log books, I am the third owner.. This car has been the best car I have ever owned and the most reliable sports package. Its a very regretful sale. It currently has 80,000km on the clock (I purchased it with 50,000 four years ago), and has a full service history. The car has always been stored in an undercover carport, and while I like some spirited driving, it has never been thrashed or treated badly. I am a mature owner with a family. The specs are: Subaru Legacy BH 1999 GT-B Personal Import - complied 80,000km full service history + Japanese log books 206kw from factory twin turbo engine 5 Speed manual Climate control/full electrics Electric drivers seat Leather/velour seats Silver colour Fog lights Factory HID - with beam adjuster switch in cabin Factory Alloy rims JDM privacy glass Never been in an accident My car also has some modifications which include: Cusco front strut brace Cusco front sway bar Cusco rear sway bar Zerosports induction connector pipe Apexi EL2 Boost gauge Custom 3inch catback with mandrel bends Fujitsubo muffler High flow Redback catalytic converter Torque Solutions short shifter (comes with factory shifter) New Pontenza RE002 amateur racing tyres (best tyres I have ever driven with) New Pioneer speakers (splits) upfront - sound fantastic (Sony in rear) I have just given the car a major service with all fluids (engine oil, transmission fluid, power steering fluid), all changed. My service centre here is an RACV qualified mechanic and last time had nothing but compliments about the car. I would also like to note, that I have never had a problem with this car, and it has been super reliable. I get about 10-12l/100km fuel mileage. The car also has never pinged in hot weather like some other Aus delivered cars. The car has always boosted correctly. It has Victorian Rego until next July I believe. I also have a few spares which may go with the car which include, some Aus spec roof racks, Rev D bonnet with ARC CF induction scoop, Zerosports cool action and an aftermarket blow off valve (had on car for one day). Price - $15,000 I am located in Geelong. Thanks Chef, so would this be soon? Have compliance shops got plates for these yet? What are the years available? I believe it can be a little bit more costly in shipping due to the route of the ships, but is a good option if you find something worthy of bringing in and will pass a roadworth easy in Aus. Some of the old Mazdas are another good option. ok guys, I am wondering why there is no Subaru on the list? Is this just because Australia has the entire line up with exception of the small cars? skylines, the life of owning one. Its not that there is a lot of them, its that fact that so many owners do them up with cheap chrome rims and candy colours! Cars with minor damage and repaired can be imported through SEVS, major damaged cars cant. Personal Imports that have been majorly damaged dont face any issue with importing. There is no way to check and it is not recorded. I would demand logs books, and do a proper inspection just like any other car in Australia.